The English word Revelation is a translation of the Greek word Apocalypse which means to unveil, uncover or reveal. Just what is it that the book of the Revelation reveals? In this series of essays, we will examine the various dynamics that pertain to this book and look at its message within the context of when it was written and to whom it was addressed. We will begin by examining the authorship and time of writing of this document. We will then explore the four major methodologies used to interpret the Revelation. Lastly, we will do a verse by verse study of the Revelation within the framework of the two most currently popular interpretative approaches. The author identifies himself four times simply as “John,” (Rev. 1:1, 4; 1:9; 22:8). Historically, most theologians identify this “John” with the John who was one of the twelve disciples of Jesus Christ, and who it is believed also wrote the Gospel of John and the three letters attributed to him. Some recent scholarship has questioned the identity of Apostle John as the author because it has been determined that the Greek grammar of Revelation is much inferior to the grammar seen in the Gospel of John and the three letters attributed to Him. It is therefore felt that the “John” who authored the Revelation cannot be the same John who authored the other four documents. Some researches have questioned whether Apostle John authored the fourth Gospel and the letters attributed to him. For a discussion of this issue go to "Did John Write the Fourth Gospel?" Defenders of Apostle John’s authorship of the Revelation point out that John is shown to be unschooled in Acts 4:13. It is concluded that John may have had his Gospel and letters dictated to a scribe and edited whereas he would not have had an editor available while a prisoner on the island of Patmos where he wrote the Revelation. It is also pointed out that the poor Greek grammar found in the Revelation could be reflective of John having to rapidly write down visions as he saw them, thus making it difficult to give much attention to proper grammar. Defenders of the Apostle’s authorship point out that there are concepts and expressions found in the Revelation that are not found elsewhere in the New Testament (NT) except in the other writings of John. For example, the Greek word logos is found 330 times in the NT scriptures but only in John’s Gospel and in Revelation is this word used to describe Christ (John 1:1 and Revelation 19:13). The Revelation repeatedly refers to Christ as the Lamb of God. Of the four Gospel writers, only John refers to Christ as the Lamb of God. It is this kind of internal evidence that has most Biblical scholars believing that John, the Apostle of Jesus Christ, is the author of the Revelation and not someone else named John. We will approach the Revelation as having been written by John the Apostle. Establishing the time frame during which the Revelation was written is critical to understanding its message. While we don’t know the date of John’s death, it is fairly certain he died before the end of the first century. Therefore his writing of the Revelation would have occurred in the first century. The question is, when in the first century was this document written? We see from the first chapter of the Revelation that its message is directed to seven churches that history shows physically existed in Asia Minor in the first century. It is important to our understanding of this message to determine whether this message was delivered to these churches before or after the destruction of Jerusalem in A.D. 70. If the Revelation was given before A.D. 70, it is possible to see its meaning and fulfillment in the destruction of the temple and the city of Jerusalem in the war of approximately A.D. 66 to A.D. 73. If it was given after this destruction, we would have to look for events after the fall of Jerusalem for meaning and fulfillment. It is this “late” versus “early” dating issue we will now address. While there have been a number of external “evidences” offered for both a late and an early dating of Revelation, these “evidences” have often been problematical. In view of this, scholars have sought to determine its dating by looking at how what is written in this document itself corresponds to the historical events of the first and second century. The first and second centuries are chosen to establish date of authorship because the Revelation begins by making specific time frame statements as to the expected fulfillment of what is written. 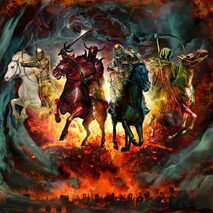 Revelation 1:1: The revelation of Jesus Christ, which God gave him to show his servants what must soon take place. Revelation 1:3: Blessed is the one who reads the words of this prophecy, and blessed are those who hear it and take to heart what is written in it, because the time is near. Revelation 22:6: The angel said to me, "These words are trustworthy and true. The Lord, the God of the spirits of the prophets, sent his angel to show his servants the things that must soon take place." A number of current scholars believe the Revelation was written during the reign of Domitian who was emperor over the Roman Empire from A.D. 81 to A.D. 96. This would place the events of the Revelation after the fall of Jerusalem. Belief in a post A.D. 70 authorship of Revelation is based on two primary considerations, one Scriptural and the other external to Scripture. There was a superstition that developed after Nero’s death in A.D. 68 that he would return from the dead and rule Rome again. Because of his similar behavior, Domitian, who began his reign in A.D. 81, was widely regarded as a “second Nero” and therefore was looked upon as being the “mortal wound that was healed” spoken of in Revelation 13. It is also felt by many interpreters that emperor worship is alluded to in Chapter 13. It is believed, however, that such worship was not enforced until the reign of Domitian. It is therefore believed the Revelation pertains to the time of Domitian and thereafter. While these are interesting observations, they do little to establish when the Revelation was written because even if John did have the Emperor Domitian in mind in chapter 13, he still could have written the Revelation prior to A.D. 70. The Revelation is prophetic in nature and John could have written this prophecy before A.D. 70 with events of post A.D. 70 in mind. Therefore the forgoing observations by the scholars have no direct bearing on when John actually wrote the Revelation. The church leader Irenaeus, who wrote in the middle of the second century A.D., made a statement that could be interpreted as saying that either John’s vision or John, himself, was seen toward the end of Domitian’s reign. "We will not, however, incur the risk of pronouncing positively as to the name of Antichrist; for it were necessary that his name should be distinctly revealed in this present time, it would have been announced by him who beheld the apocalyptic vision. For that was seen no very long time ago, but almost in our day, toward the end of Domitian's reign." This statement by Irenaeus is considered problematical in so much as scholars are not certain as to its meaning. If Irenaeus did mean the Revelation was received toward the end of Domitian’s reign, it would make the idea that Chapter 13 is prophetic of Domitian a mute point as his reign would have been practically over when John wrote the Revelation and could not be considered prophetic of his reign. In another statement by Irenaeus, he alludes to there being “ancient copies” available of the Revelation. This is thought to be a puzzling statement by Irenaeus if he also said the Revelation appeared during the end of Domitian’s reign. Since there are historical indicators that John lived into the A.D. 90’s, it would appear more evidential to conclude that Irenaeus is talking about John being seen near the end of Domitian’s reign and not the Revelation being written at that time. There is one interesting piece of history that may explain the confusion surrounding the dating of the Revelation. Historian G Edmundson, in a series of lectures given in 1913, entitled “The Church in Rome in the First Century,” speaks of Domitian, the younger son of Emperor Vespasian, actually acting as Roman Emperor in early A.D. 70 on behalf of his Father who was occupied at the time with affairs in Alexandria. The young Domitian was relived of his duties upon the return of his father and later became Emperor after his father’s death. It could be that Irenaeus was referring to John being seen during the time of this temporary reign of a young Domitian and not during the time of Domitian’s reign after A.D. 70. Advocates of a pre A.D. 70 dating of the Revelation provide a variety of Scriptural evidences for their position. They will turn to Revelation 17: 9-10, where seven kings are spoken of with five having fallen, one is, and the other has not yet come. In actual history, five Roman emperors had come and gone (Julius Caesar, Augustus Caesar, Tiberius Caesar, Caligula, and Claudius Caesar) with Nero being the sixth. It is believed that the “one is” refers to Nero. Since John speaks of the "one is" (sixth) Emperor being in power as he writes, it can be safely concluded that he is writing prior to A.D. 70 as Nero’s reign ended in A.D. 68. Pre A.D. 70 defenders believe the number 666 applies to Nero. In Latin, Greek, Hebrew and other older languages, letters were used to represent numbers. It is believed that John wrote in code to hide the meaning from the enemies of first-century Christians. John was a Jew and understood Hebrew and yet wrote the Revelation in Greek. To identify the beast numerically in Greek would have been too easy to recognize by the enemies of the Christians. It is believed what John did was to identify Nero in Hebrew letters. The reader would have to know the Hebrew equivalents to the Greek letters in order to arrive at the proper meaning, the same way we have to know English equivalents to the Greek letters in order to understand the meaning. Nero’s full title name as Roman Emperor was Nero Caesar. In Hebrew, translated into Greek, Nero Caesar is rendered (in English characters) as: NRWN QSR. In Hebrew it is pronounced “Neron Kaiser.” The numbers associated with these letters are N=50, R=200, W=6, N=50, Q=100, S=60, R=200. This totals 666. It is felt that what gives greater evidence to Nero’s being the beast of Revelation 13 is that in several very early copies of the Greek New Testament, the number 616 is given which is the Latin numerical equivalent of the name Nero Caesar. What this suggests is the copiers knew that 666 in the Greek represented Nero and were simply using the Latin numerical designation they were well aware of. It is pointed out that in Revelation 13:5-7 John writes that the beast was given authority for forty-two months and given power to make war against the saints. History shows Nero’s persecution against the Christians began in November of A.D. 64, and continued until June of A.D. 68. It was in June of A.D. 68 when Nero committed suicide. The period of November A.D. 64 to June 68 is a period of forty-two months. In Revelation 9:5 &10, the fifth angel sounds and locusts are seen as given power not to kill but to torment for five months. It is pointed out by historians that the Roman siege of Jerusalem began on the 14th of Nisan (April) of A.D. 70 and ended on the 8th of Elul (September) A.D. 70., a period of 134 days which is just short of a normal five month period. The inhabitants of Jerusalem held out against the Romans during this five month period while suffering greatly from internal strife and starvation. In Revelation 11:1-2: John is told to measure the temple, altar and inner court but to exclude the outer court because it has been given to the Gentiles. It is then recorded that the Gentiles will trample the Holy City for 42 months. It is pointed out that the Temple is seen as still standing at the time of John writing the Revelation. The statement about 42 months which equals approximately three and one-half years, is viewed as corresponding to the period of early spring A.D. 67, when the Roman General Vespasian began his march against Jerusalem, and the early fall of A.D. 70 when the temple was destroyed. It is this apparent correlation between what is written in the Revelation and actual historical events involving the Roman/Jewish war that is felt by early date advocates to be confirmation of a pre A.D. 70 authorship. In addition to the Scriptural evidence presented, defenders of a pre A.D. 70 authorship also point to some external evidence to support their position. Clement of Alexandria, a much respected second/third century leader in the church at Alexandria Egypt, wrote that apostle John moved from the island of Patmos to Ephesus after the death of the tyrant. While late date advocates believe Clement is speaking of Domitian as the tyrant, history shows Nero to fit the description far better. Nero was called a tyrant by various first century historians. Some histories actually refer to Nero as a beast. All indications are that John left Patmos way before Domitian became emperor in A.D. 81. The Muratorian Fragment (aka the Muratorian Canon), is fragments of a Latin manuscript dated to somewhere in the seventh century AD. This fragment, was discovered by Ludovico Antonio Muratori, a prominent Italian historian. This document was published in 1740 and was named after Muratori. This document appears to have originally been written in Greek around 170 AD. It is thought to have been written about this time because the author refers to Pius the 1st as having recently been the Bishop of the church at Rome. Pius was Bishop from 140 to 155 AD. This document contains commentary on the NT Scriptures and lists 22 of the 27 books of our present day New Testament. In this manuscript the author writes of Paul following the rule of his predecessor John in writing to seven churches. The writer lists the seven churches Paul wrote to which are the seven churches shown in the NT as having received letters from Paul. Below is the excerpt from the Muratorian Fragment that speaks to this matter. Apostle Paul, following the rule of his predecessor John, writes to no more than seven churches by name, in this order: The first to the Corinthians, the second to the Ephesians, the third to the Philippians, the fourth to the Colossians, the fifth to the Galatians, the sixth to the Thessalonians, the seventh to the Romans. Moreover, though he writes twice to the Corinthians and Thessalonians for their correction, it is yet shown—that is, by this sevenfold writing—that there is one Church spread abroad through the whole world. And John too, indeed, in the Apocalypse, although he writes only to seven churches, yet addresses all. All indications are that Paul died during the reign of Nero which means he wrote these letters before AD 68 which is the year Nero died. Most scholars believe Paul wrote his letters somewhere in the 50's to early 60's AD. We know that John wrote to seven churches as seen in Revelation 2 and 3. If indeed Paul followed the example of John as this document suggests, this would indicate John wrote the Revelation before Paul wrote his letters. This would place the writing of the Revelation much earlier than is commonly believed. We know that one Church John wrote to was the Church at Laodicea (Revelation 3:14). Laodicea, along with the closely situated cities of Colossae and Hierapolis, were badly damaged by an earthquake around AD 60 (See the writings of Roman historian Tacitus). Some believe the Revelation shows Laodicea was a city of richness (Revelation 3:17) and it would have taken several decades to be restored to that same level of richness after the earthquake. This would take us into the 90's during the reign of Domitian. Therefore, this is seen as evidence for John writing the Revelation in the 90's AD. However, the Roman historian Tacitus writes that Laodicea was rapidly rebuild and did not need funding from Rome to do so, suggesting the city had the wherewithal to quickly recover from the earthquake. Therefore, Laodicea could have returned to normality within a couple of years or less after the earthquake. If this was the case, John could have been writing to this city in the middle 60's AD. He could also have written to this city before the earthquake for the following reason. Paul wrote to the Church at Colossae and also directed that this same letter be read to the Church at Laodicea (Colossians 4:16). He also alludes to there being a Church in Hierapolis (Colossians 4:13). There is no indication in anything Paul wrote that there had been an earthquake. Many scholars believe this letter was written in the late 50's AD. If this letter was written in the late 50's AD and Paul was following the example of John in writing seven letters to Churches as the Muratorian fragment suggests, the Revelation could have been written as early as the 50's AD. This would place John on the Island of Patmos much earlier than commonly believed. It must be noted that seeing John's banishment to the island of Patmos as occurring in the 90's AD is based on tradition and not established evidence. While tradition can be helpful in establishing the time and place of an event, unless such tradition is based on sound evidence it can be problematical. While there is no definitive evidence in the Scriptures or secular history as to when or by whom John was exiled to Patmos, there are sound indications it was during the reign of Nero (AD 54 to AD 68) which will become apparent as we proceed with this discussion. The collective evidence here presented would favor a pre A.D. 70 dating for the Revelation. The time statements showing imminency of fulfillment and the seeming alignment of historical events with what is written in the Revelation are instructive. Many well-known scholars have held to the pre A.D. 70 dating. Dr. Kenneth Gentry, author of Before Jerusalem Fell, Dating the Book of Revelation, lists over 130 notable scholars and commentators who favor the pre A.D. 70 dating of Revelation. It must be pointed out that many scholars who believe in a pre A.D. 70 dating don’t necessarily see all the events described by John as corresponding to the destruction of the Temple and the city of Jerusalem. Many see some fulfillment of the Revelation in the destruction of Jerusalem while seeing additional fulfillment as future from that event. Those who embrace the late date perspective see fulfillment in certain events during the time of the Roman Empire but also see additional fulfillment in our future. Still others see the Revelation entirely fulfilled in the first century while some see it as being totally fulfilled in the future. We will now examine the four most prominent of the various interpretive approaches to the Revelation. The historicist believes that God reveled the entire church age in advance through the symbols of the Revelation. This approach makes great use of the “year for a day” principle. It advocates that God revealed exact time frames for various events but cast them in symbols that represent a year for a day. According to this methodology, the 1260 days of the Revelation would equal 1,260 years in actual fulfillment. The historicist sees a great deal of the Revelation fulfilled in events associated with the Roman Empire. For example, the breaking of the seven seals is seen as the barbarian invasions that brought the Western Roman Empire to its knees. The Arabs attacking the Eastern Roman Empire is seen as associated with the locusts that come out of the bottomless pit. The papacy is considered the antichrist under this system. Like all interpretive systems, historicists disagree among themselves as to how certain prophesies are fulfilled. For example, whereas many historicists agree among themselves that the seven trumpets are associated with the Arabs attacking the Eastern Empire, they disagree among themselves as to whether the seven seals relate to the fall of the Western Empire or the fall of Jerusalem. Like several other interpretive systems, historicists tend to see the culmination of history occurring during their lifetime which over and over it fails to do. A major problem with the historicist approach is that its interpretations are of such nature as to leave little applicability to those to whom the Revelation was initially addressed. It primarily focuses on the period of the Middle Ages and the Reformation. Yet the original audience to whom the Revelation was addressed was told that the time was near and the events prophesied in the Revelation must soon take place. The historicist approach has been around to one degree or another since the second century to the beginning of the nineteenth century. This interpretive approach has been somewhat discredited and is not currently in vogue within the Christian community. Therefore we will not include it in our verse by verse study of the Revelation. The term preterist means past fulfillment. This approach is sometimes referred to as realized or fulfilled eschatology. Eschatology is the study of last things. Preterism has been around in one form or another since the second century and continues to the present. In fact it has experienced a significant resurgence in recent years. There are partial preterists and full preterists. Partial preterists believe significant portions of the Revelation were fulfilled in the fall of Jerusalem but prophesies found in the last several chapters of this document are still future in their fulfillment. Full preterists believe that all of the Revelation was fulfilled in the events surrounding the Roman/Jewish war in the first century. Preterists believe that the seventy weeks prophesy found in Daniel 7, Daniel 12, the Olivet Discourse found in Matthew 24, Mark 13 and Luke 21 and the prophecies of the Revelation are all tied together. It is believed that all these prophecies pertain to judgement upon Israel which is seen in the catastrophic events of the Roman/Jewish war which led to the destruction of the temple, the city of Jerusalem and much of the land of Israel and its peoples. It is believed this judgment completed the transition from the Old Covenant to the New Covenant. Preterists view the Revelation as a letter written to first century Christians regarding first century events that John says were about to come to pass. Therefore, this interpretive approach places great emphasis on the Revelation being relevant to those to whom it was originally addressed. Since the Preterist approach is a growing perspective in the Christian community, it will be a primary focus as we examine the Revelation. Futurism is by far the dominant interpretive perspective in today’s Christian community. The leading version of futurism is Dispensational Premillennialism, inaugurated by J.N. Darby in 1830. This view sees the history of man set in seven God ordained dispensations of time with the final dispensation being a thousand year millennial reign of Christ. This view embraces a rapture of Christians followed by a seven or three and one-half year (depending on who you talk to) tribulation followed by the return of Christ to a rebuilt temple in Jerusalem from where He will reign with the resurrected saints for 1000 years. Futurists see most of the Revelation as future in its fulfillment and take a much more literal approach to interpreting the symbols found in this prophecy. As with the Preterists, Futurists tie the seventy weeks prophesy and the Olivet Discourse to the prophesies of Revelation but see them as future in fulfillment rather than having been fulfilled as is the case with Preterism. Some futurists mix in a little bit of Historicism in their approach. For example, some may see the seven headed, ten horned beast of Revelation 17 as a continuum of world empires beginning with the Babylonian Empire of 635 to 538 B.C. and running all the way to a projected revival of the Roman Empire sometime in our future. Futurism has always been an interpretive method. Prophecy, by its very nature, requires a futuristic approach as all prophecy, by definition, is the foretelling of future events. The key to understanding prophecy is to determine how future from the time a prophecy is given does its fulfillment take place. Preterism sees the Revelation being fulfilled shortly after the prophecy was given. Futurism sees the Revelation largely being fulfilled thousands of years after it was given. A major problem with modern futurism is that it virtually ignores audience relevance. By seeing most of the Revelation as future in fulfillment, it removes any significant meaning for those to whom the message was originally addressed. The first century readers of the Revelation were told the events they were reading about would soon take place. If indeed these events were meant to take place thousands of years after these first century readers were all dead, what possible meaning could such statements as “the time is near” and “must soon take place” have for these people? Futurists must find creative ways to deal with the time statements found in the Revelation which all indicate that the prophesied events were soon to take place. Since futurism is the primary methodology in current use among interpreters, it, along with Preterism, will be the primary focus of our attention as we examine the Revelation message. The Spiritual approach is sometimes referred to as the Idealistic approach. This interpretive method sees in the symbols of the Revelation a variety of spiritual lessons and principles which may have recurrent expression and applicability in history. This approach sees the overall theme of Revelation as the triumph of good over evil, Christ over Satan, good religion over bad religion and the victory of the righteous over the wicked. This approach would see the Babylon of Revelation as descriptive of all that is evil down through time as opposed to it symbolizing a particular evil entity such as a revived Roman Empire or rebuilt Babylon, which is the Futurist interpretation, or symbolizing the city of Jerusalem, which is the Preterist interpretation. While the Spiritual approach offers some interesting analogies, it fails to identify specific entities and events which it should be obvious John is writing about. John repeatedly refers to time frames in which certain things are to happen. The Spiritual approach virtually ignores the identity of these specific entities and time frames. First century readers of the Revelation would not have understood this message in terms of spiritual principles when John tells them from the start that they need to take this message to heart because the time for its fulfillment is near. While the Spiritual approach is sometimes found mixed in with the historicist, preterist and futurist approaches, it does not draw much attention as a separate interpretive methodology in today’s Christian community. Because of this, and the drawbacks cited above, we will include the Spiritual interpretative approach only as it may interface with the Preterist or Futurist approach. We have reviewed the four approaches historically used to interpret the Revelation. Some believe that all four approaches have validity. There is no question one can draw parallels between historical events and what John wrote. This is what the historicist, preterist and futurist do. There is no question you can create spiritual analogies from what John wrote. This is what those who take the spiritual or idealistic approach do. The challenge we have is determining what the intention of God was in revealing this prophecy to John. While drawing historical parallels and spiritual analogies can make for interesting interpretations, such interpretations can stray far from the intended meaning of the Revelation and thus lead to invalid conclusions. The Revelation means something. It can’t mean everything. The four interpretive approaches will have validity only to the extent that what they offer can be documented by reasonable evidence. The Revelation had to mean something specific to first century Christians to whom it was addressed. It wasn't written as an open ended message having multiple interpretations. In this series, we will seek understanding of what the Revelation meant to the first century Christians to whom it was addressed. We will examine the Revelation within the context of pre A.D. 70 historical events as there is much stronger association between these events and what is written in the Revelation than in events after A.D. 70. Our goal in this series is to seek a preponderance of evidence for any conclusions we may draw. We are now ready to begin our examination of the Revelation. Our approach will be systematic, practical and evidence oriented. We will make ever effort to allow Biblical scripture, wherever possible, to guide our understanding of what John wrote. We will strive to understand how the original recipients of John’s letter would have understood this message. We will consider the social, cultural, political and religious context in which John wrote. Lastly, we will frame our discussion within the two currently popular interpretative approaches, Preterism and Futurism, and bring in Historicism and Idealism only as they may interface with Preterism and Futurism. Let’s begin our journey. 1-3: The revelation of Jesus Christ, which God gave him to show his servants what must soon take place. He made it known by sending his angel to his servant John, who testifies to everything he saw--that is, the word of God and the testimony of Jesus Christ. Blessed is the one who reads the words of this prophecy, and blessed are those who hear it and take to heart what is written in it, because the time is near. These first three verses speak of John in the third person suggesting an editor may have inserted this introduction as descriptive of how this massage came about. On the other hand, John could have simply been speaking about himself in the third person. We sometimes talk this way ourselves. For example, I, Dave could say, “the information that Jim gave to Tim to show his employee Dave, etc.” Here I would be talking in the third person about myself having received information from my boss Tim who got the information from Jim. We see God giving the Revelation to Jesus Christ to show His servants what must soon take place. Christ is shown as being given this message and making it known to His servants by sending it via an angel to John. John then testifies to what he saw as the word of God and confirms Christ testified of this word to John through the angel. So we see this message coming from God to Christ, given to an angel who gives it to John who gives it the intended recipients who we are told are the servants of God. John says those who read the words of this prophesy and take to heart what is written are blessed. John says they are blessed because the time is near. John said from the start that God gave this Revelation to Christ to show His servants what must soon take place. It is here where we will begin to look at the views of the Preterist and the Futurist. The Preterist takes this passage to mean exactly what it appears to say. This is seen as a prophecy of events that would soon take place and the time was near for them to indeed take place. The Preterist will look at how the Greek words translated into our English words soon and near are used throughout the New Testament narrative. They will find that these words, when looked at in context, always mean something about to happen. It is therefore concluded that there is no grammatical, linguistic or contextual reason to believe these words suddenly change their meaning when John uses them in the Revelation. Since most preterists believe the Revelation was written prior to A.D. 70, it is concluded that the events which John says were near and would soon take place were the events defined by the Roman/Jewish war of A.D. 66 to 73 when Jerusalem fell, the temple was destroyed and much of Israel was left in shambles. The Futurist will counter the Preterist by saying that the Greek word for soon can also mean “quickly” and therefore it’s concluded that John is saying that when the prophesied events of the Revelation begin to happen they will happen quickly but these events could first begin to happen many years removed from this prophecy. The Preterist will respond by pointing out that the servants being addressed are those belonging to seven churches existing in the province of Asia Minor in the first-century. It is these servants of God who are being addressed and asked to take heart because the time is near. It is argued that such admonition would have been meaningless to these servants of God if John is speaking of events that were to take place thousands of years after they were all dead. The futurist will contend that God is speaking in terms of how He measures time, not how man does. They will quote 2 Peter 3:8 where Peter writes that a day to God is as a thousand years and a thousand years as a day. The Preterist will counter by saying that if you are going to apply 2 Peter 3:8 to define soon and near in the Revelation you will have to do so throughout the scriptures which would result in rendering absurd meanings to hundreds of passages where soon and near are seen by context to mean soon and near as we understand those terms. Preterists acknowledge that there is a good deal of symbolism and metaphor in scripture but point out that words like soon and near are basic straightforward, terms of human communication. Preterists contend that if we can’t take such plain statements to mean what they normally mean, then Scripture, as a vehicle for communicating God’s message to man, becomes impossible to understand. Preterists point out that Scripture is not written in "double-speak" where words mean opposite of what they normally mean. Preterists point out that God is not playing word games in his message to John where God defines soon and near in one way while the readers of this message understand these words in their normal since. This prophecy is quoted from Jeremiah 31:15. A careful reading of Jeremiah 29 through 31 will reveal that Jeremiah is dealing with the problem of Judah’s dispersion created by the Babylonian captivity and their returning from that captivity. It’s an entire message of hope and not one of mourning. Jeremiah is reflecting on the plight of the Israelites in captivity but also showing they would be released from their captivity. There is nothing in this passage that is predictive of Herod killing the children in Bethlehem. Yet Matthew applies duality to what Jeremiah said by applying it to the Christ event. The futurist sees this kind of dual application as proof that duality is found in the scriptures. The Preterist will agree that such dual application is found in scripture, but will point out that there is no such type/anti-type found in the Revelation. The Revelation simply gives an account of events that John claims are about to take place. There are no passages in the Revelation or anywhere else in scripture that point to a dual application of what John wrote. The Preterist points out that you can’t assume duality when there is no indication of such duality. Similar events happen all the time. This doesn’t mean such happening of similar events is an extended or greater fulfillment of some ancient prophecy. Preterists will point to the Olivet Discourse where Christ answers the disciple’s questions about when the temple would be destroyed. In this prophecy, Christ speaks of wars, famines and earthquakes. The Preterist will show that a number of wars, famines and earthquakes occurred in the Roman Empire just prior to the temples destruction. The preterist will ask; Is there duality here? Can wars, famines and earthquakes since the first century be considered fulfillment of this prophecy? Nothing in scripture would suggest such duality. All Christ is doing is telling his disciples what was going to happen in anticipation of the temple being destroyed. Preterists are telling the futurist to simply see things in context and not assume duality unless such duality is clearly expressed in scripture.